Not to be confused with Bedford Borough, Pennsylvania. Bedford County is a county located in the U.S. state of Pennsylvania. As of the 2010 census, the population was 49,762. The county seat is Bedford. In 1750 Robert MacRay, a Scots-Irish immigrant, opened the first trading post in Raystown (which is now Bedford) on the land that is now Bedford County. The early Anglo-American settlers had a difficult time dealing with raids from Native Americans. In 1754 fierce fighting erupted as Native Americans became allied with the British or French in the North American front, known as the French and Indian War, of the Seven Years' War between those nations in Europe. In 1759, after the capture of Fort Duquesne in Allegheny County, on the Allegheny and Monongahela rivers, English colonists built a road between the fort (which was renamed as Fort Pitt) to the newly built Fort Bedford in Raystown. The English defeated the French in the war and took over their territories in North America east of the Mississippi River. Treaties with the Indians opened more land for future peaceful settlement. This road followed and improved on ancient Indian trails. In later years it was widened and paved as "Forbes Road"; it is now Route 30. When the Pennsylvania Turnpike was built, this interstate toll road became the main highway through Bedford County. 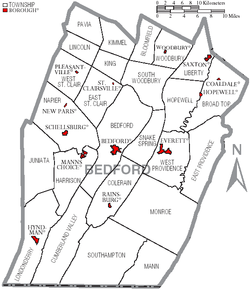 Bedford County was created on 9 March 1771 from part of Cumberland County and named in honor of Fort Bedford. The 1767 Mason-Dixon Line had stabilized the southern border with Maryland. In the aftermath of the American Revolution, the population increased largely due to emigration. Within a lifetime Old Bedford County was greatly reduced from its original boundaries. Huntingdon County was created on 20 September 1787, mainly from the north part of Bedford County, plus an addition of territory on the east (Big Valley, Tuscarora Valley) from Cumberland County. Somerset County was created from part of Bedford County on 17 April 1795. Centre was created on 13 February 1800 from parts of Huntingdon, Lycoming, Mifflin, and Northumberland counties. Cambria County was created on 26 March 1804 from parts of Bedford, Huntingdon, and Somerset Counties. Blair County was created on February 26, 1846 from parts of Huntingdon and Bedford Counties. Finally Fulton County was created on 19 April 1850 from part of Bedford County, setting the county at its current boundaries. The land was developed into lush farms with woodlands. It was developed as a trading center on the way to Pittsburgh and farther west of Pennsylvania. In 1794 President George Washington came to the county in response to the Whiskey Rebellion. View from Glade Pike on Dry Ridge. In the late 19th century, the Bedford Springs Hotel became an important site for wealthy vacationers. It was built near natural springs that had been important to the Native Americans for hundreds of years. During the administration of President James Buchanan, he moved much of his administration to the hotel, which became the informal summer White House. The U.S. Supreme Court met at the hotel once. It was the only time that the high court met outside of the capital. During the late 19th century, the county had a population boom, with the number of people doubling between 1870 and 1890. Railroads constructed through the town connected the county with the mining industry. The story of the Lost Children of the Alleghenies originates from Blue Knob State Park in the county. According to the U.S. Census Bureau, the county has a total area of 1,017 square miles (2,630 km2), of which 1,012 square miles (2,620 km2) is land and 4.6 square miles (12 km2) (0.5%) is water. Bedford County is situated along the western border of the Ridge and Valley physiographic province, which is characterized by folded and faulted sedimentary rocks of early to middle Paleozoic age. The northwestern border of the county is approximately at the Allegheny Front, a geological boundary between the Ridge and Valley Province and the Allegheny Plateau (characterized by relatively flat-lying sedimentary rocks of late Paleozoic age). The stratigraphic record of sedimentary rocks within the county spans from the Cambrian Warrior Formation to the Pennsylvanian Conemaugh Group (in the Broad Top area). No igneous or metamorphic rocks of any kind exist within the county. The primary mountains within the county (From west to east: Wills, Evitts, Dunning, and Tussey mountains) extend from the southern border with Maryland to the northeast into Blair County, and are held up by the Silurian Tuscarora Formation, made of quartz sandstone and conglomerate. Chestnut Ridge is a broad anticline held up by the Devonian Ridgeley Member of the Old Port Formation, also made of sandstone and conglomerate. Broad Top, located north of Breezewood, is a plateau of relatively flat-lying rocks that are stratigraphically higher, and thus younger (Mississippian and Pennsylvanian), than most of the other rocks within the county (Cambrian through Devonian). Broad Top extends into Huntingdon County to the north and Fulton County to the east. The Raystown Branch of the Juniata River is the main drainage in the northern two-thirds of the county. The river flows to the east through the mountains within the county through several water gaps caused by a group of faults trending east–west through the central part of the county. The river then turns north and flows into Raystown Lake in Huntingdon County. The southern third of the county is drained by several tributaries of the Potomac River. Both the Potomac and Juniata rivers are part of the Chesapeake Bay Watershed. Several limestone quarries exist in Bedford County, most of which are owned and operated by New Enterprise Stone and Lime Company. Quarry locations include Ashcom, New Paris, Kilcoin, and Sproul. Two coal fields exist within Bedford County. One is the Broad Top Field in the northeastern corner of the county, and the other is the Georges Creek Field along the southwestern border. Both fields contain bituminous coal. There are abandoned mines in both areas and acid mine drainage is an environmental problem in the Broad Top area, where several fishless streams exist as a result of the discharge from the abandoned mines. Natural gas fields and storage areas exist in southeastern Bedford County, primarily within folded Devonian rocks south of Breezewood. Another deep gas field exists in the vicinity of Blue Knob on the border with Blair County to the north. As of November 2014, there are 32,327 registered voters in Bedford County. As of the census of 2010, there were 49,762 people, 20,233 households, and 14,251 families residing in the county. The population density was 49 people per square mile (19/km²). There were 23,954 housing units at an average density of 23 per square mile (9/km²). The racial makeup of the county was 98.0% White, 0.5% Black or African American, 0.2% Native American, 0.2% Asian, 0.0% Pacific Islander, 0.3% from other races, and 0.8% from two or more races. 0.9% of the population were Hispanic or Latino of any race. There were 20,233 households out of which 28.8% had children under the age of 18 living with them, 57.5% were married couples living together, 8.2% had a female householder with no husband present, and 29.6% were non-families. 25.7% of all households were made up of individuals and 12.5% had someone living alone who was 65 years of age or older. The average household size was 2.43 and the average family size was 2.90. In the county, the population was spread out with 21.6% under the age of 18, 7.0% from 18 to 24, 23.0% from 25 to 44, 29.4% from 45 to 64, and 19.0% who were 65 years of age or older. The median age was 43.9 years. For every 100 females age 18 and over, there were 96.2 males. According to research by The Center for Rural Pennsylvania, which is a legislative Agency of the Pennsylvania General Assembly, the poverty rate for Bedford County was 13.6% in 2014. The statewide poverty rate was 13.6% in 2014. The 2012 childhood poverty rate by school district was: Bedford Area School District - 36.1% living at 185% or below than the Federal Poverty Level, Chestnut Ridge School District - 44.7%, Everett Area School District - 50.5%, Northern Bedford County School District - 42.4% and Tussey Mountain School District - 57.1%. Bedford County's live birth rate was 560 births in 1990. The County's live birth rate in 2000 was 592 births, while in 2011 it had declined sharply to 484 babies. Over the past 50 years (1960 to 2010), rural Pennsylvania saw a steady decline in both the number and proportion of residents under 18 years old. In 1960, 1.06 million rural residents, or 35 percent of the rural population, were children. Pennsylvania’s birth rate has been declining for two decades. According to data from the Pennsylvania Department of Health, in 1990, the Commonwealth of Pennsylvania’s birth rate was 171,053. In 2000, Pennsylvania’s birth rate was 145,874. Finally in 2011, the State’s birth rate declined further to 142,021. From 2000 to 2009, the number of babies born in rural counties declined 5 percent. Bedford County had 341 babies born to teens (age15-19) in 2011. In 2015, the number of teen births in Bedford County was 295. Pennsylvania resident students may also attend any of the Commonwealth's 13 public cyber charter schools which provide instruction via computers and the Internet. Bedford County Airport is a public use airport in Bedford County. It is owned by the Bedford County Airport Authority and is located four nautical miles (7.4 km) north of the central business district of the borough of Bedford, Pennsylvania. There are 3 Pennsylvania state parks in Bedford County. The largest borough-owned park in the county is a 77-acre community park in Everett, Pennsylvania - open to the public and available for events. Mid State Trail (Pennsylvania) and Great Eastern Trail pass through Everett and Tenley Park. Map of Bedford County, Pennsylvania with Municipal Labels showing Boroughs (red) and Townships (white). The population ranking of the following table is based on the 2010 census of Bedford County. ^ Locke, Karen (2016). "The Rich History of Omni Bedford Springs". Omni Hotels. ^ "Geology" (PDF). www.dcnr.state.pa.us. Retrieved 20 November 2018. ^ Leip, David. "Dave Leip's Atlas of U.S. Presidential Elections". uselectionatlas.org. Retrieved 20 November 2018. ^ Voter Registration Statistics. Dos.state.pa.us. Retrieved on November 4, 2014. ^ a b "American FactFinder". United States Census Bureau. Archived from the original on September 11, 2013. Retrieved October 20, 2014. ^ Pennsylvania Budget and Policy Center (2012). "Student Poverty Concentration 2012". Archived from the original on 2015-12-22. Retrieved 2015-12-16. ^ Pennsylvania Department of Education (August 2015). "Charter Schools". Wikimedia Commons has media related to Bedford County, Pennsylvania.